I know this doesn't look like a whole lot, but boy did it take a long time to drape! 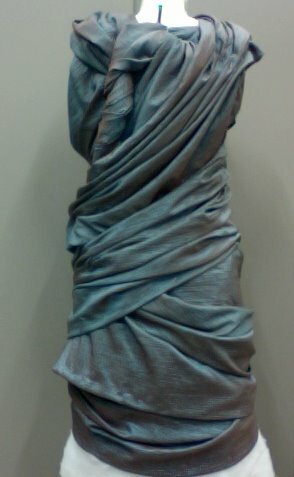 One of our most recent assignments in Draping class was to drape a dress based on a modern fashion image of a draped dress. The original was made of primitive pleated silk. We replicated it with primitive pleated taffeta. First we draped and constructed a darted shift for underneath the dress. 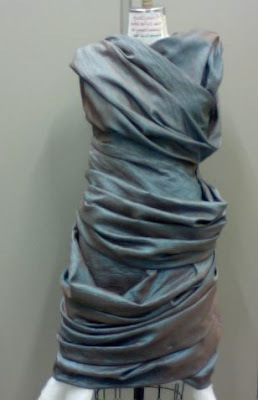 Then the fashion fabric was draped on the form over the shift. 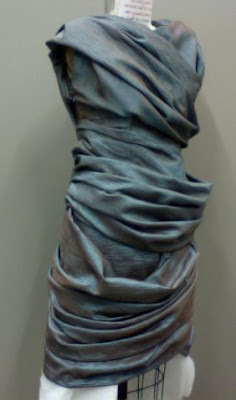 To finish the dress, the drape would be hand tacked in place to the shift. The original had the look of fabric that had been wrapped around the body somewhat carelessly immediately before the model walked the catwalk. 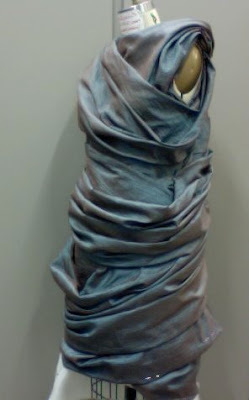 In actuality, the garment would have been draped and tacked to an understructure to carefully hold the drape in place. When given this project, our initial reaction was, 'oh, this will be easy.' But it was much more difficult than that. Especially for me. It was very difficult to let go of my control of the fabric and let it drape in the way it wanted to while still remaining as true as possible to the original image. But by the end, it was much more enjoyable. Back - with extra fabric twirled and tucked at top - would be removed in actual garment.